English - Ikebana International Biberach e.V. 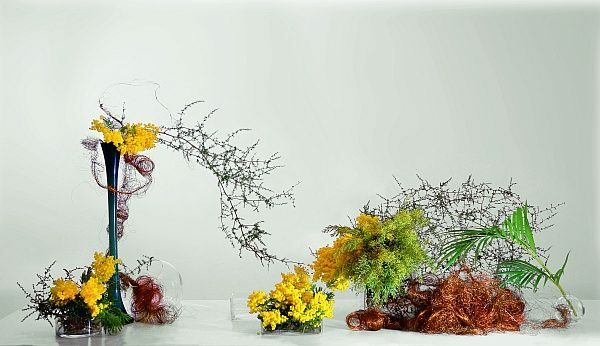 Ikebana is the art of arranging flowers that demands passion, emotion, imagination and predominantly a Iove for plants. Only a very close Iook gives an impression of the variety of plants in form, shape and colour, in size and character. During the different seasons their Special habits and laws of growing can be experienced. Ikebana is an expression of mental Exchange between man, plant and universe. Sofu Teshigahara, the founder of the Sogetsu school, called Ikebana „the language of flowers“. As in every language it demands a certain grammar, that the teacher of Sogetsu School teach in their lessons. With Ikebana one discovers a new manner of seeing, of reducing things to the essence and, as flowers are short-lived, of letting go.